Die Straße um die Iveragh (Uíbh Rátchach)-Halbinsel, auch Ring of Kerry genannt, führt um den höchsten Berg der Insel, den Carrauntoohill (1041 m), meist direkt an der Küste entlang. Die vom Golfstrom begünstigte Halbinsel bietet üppige Vegetation und viel schöne Aussichten, sowohl in das Landesinnere als auch auf das offene Meer hinaus. Fast parallel dazu verläuft der für Wanderer besonders empfehlenswerte Kerry Way. Das Bild zeigt den Teil der Ballinskellig Bucht südlich von Waterville. The road around the Iveragh (Uíbh Rátchach) peninsula, also known as Ring of Kerry, leads around the highest mountain of the island, the Carrauntoohill (1041 m), mostly along the coastline. The peninsula that benefits from the Gulf Stream, offers amply vegetation and lots of beautiful views, into the land as well as out to the open sea. Almost parallel to it, the Kerry Way runs, which is highly recommended for hikers. 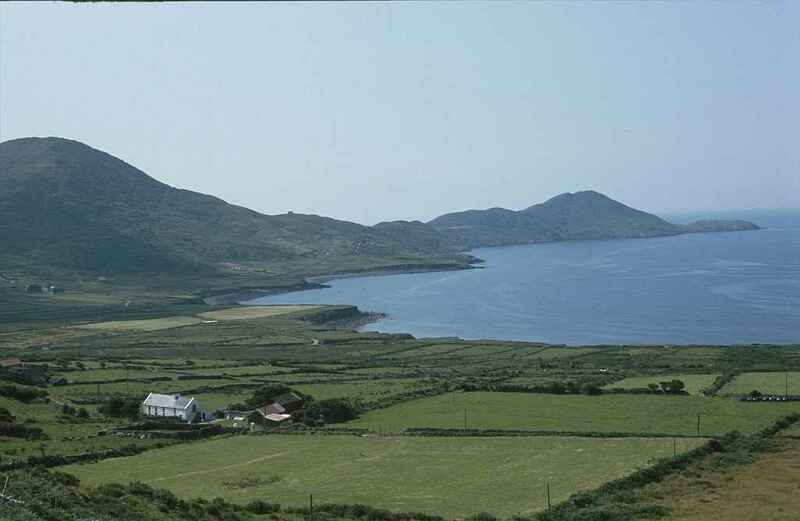 The picture shows the part of the Ballinskelligs Bay south of Waterville.